The women of Timor-Leste traditionally wear tube-skirts, known as tais. These tube-skirts are made of hand woven cotton cloth and are decorated with colours and motifs indicative of the region, village and clan to which they belong. This black tube-skirt, known as tais ema, was intended for wear during ceremonial occasions and funerals.Cultural etiquette in Timor-Leste requires women in public to tie their hair in a bun, secured with decorative hair pins known as ulsuku. 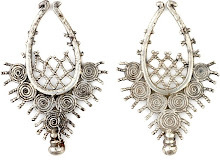 Bracelets such as kelu and earrings are commonly worn by women as adornment. However, on special occasions, family heirlooms including rare hair pins, known as saufi, ceremonial bracelets, known as keke and morten necklaces are worn with grace and dignity. At such times the women of Timor-Leste beat the babadok drum, as accompaniment for the tebe dance, which they perform in honour of their ancestors.